Forest & Bird's Ruapehu Lodge is a great place to visit any time of the year. To make a booking or for a full list of prices, use our online booking form. If you are not yet a member, you become a temporary member of Forest & Bird while at the Lodge. We would love to have you as a member and receive our world-class conservation magazine 4 times per year. But more than that, you will be helping New Zealand’s leading independent voice for the natural environment. Adult membership begins at $59 per year. 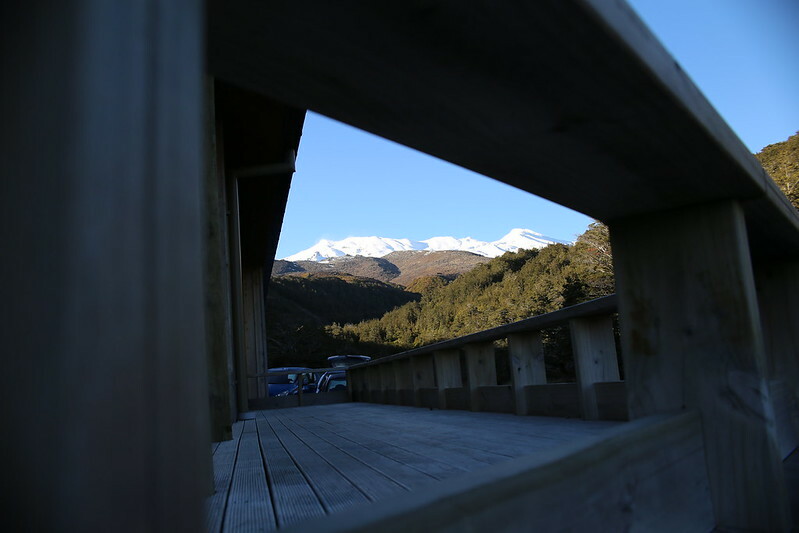 For questions about Ruapehu Lodge, please contact Forest & Bird’s National Office on 0800 200 064. The lodge offers warm, comfortable accommodation and is only a short drive from the Whakapapa ski field. It overlooks the Whakapapanui River and is surrounded by native beech forest with a wonderful view of Mt Ruapehu. It is close to a range of interesting day walks where you may see native wildlife including whio (blue duck), tomtits, robins, tūī, grey warbler, rifleman (titipounamu), bellbirds, fantails, or kererū. There are cafes and restaurants in the village, which is just a 10-minute walk away. Here, you will also find the Department of Conservation's visitor centre, which is well worth a visit. For your own safety, please check out all walks and weather conditions with the DOC visitor centre. Three bunkrooms that sleep four people each. One bunkroom that sleeps six people. One upstairs bunkroom that sleep 14 people. The main floor of the lodge is wheelchair-friendly, with a ramp to the entrance and an accessible bathroom. Visitors need to supply their own bedding (blankets/sleeping bags, pillowcases), a towel, toiletries, tea towels, toilet paper, dishwashing liquid and food, as well as suitable equipment and clothing for mountain and snow conditions, and light shoes or slippers for inside the lodge. A limited range of food supplies can be purchased at the Whakapapa Motor Camp Store but they are generally expensive. The nearest supermarkets are at Ohakune and Turangi. Infants who do not require a bed can stay free-of-charge. The lodge has no full-time custodian but is looked after by Society members acting as wardens. If no warden is present, please report any urgent repairs or cleaning materials that may be required to Forest & Bird's National Office. Guests are requested to ensure that the lodge is locked at all times when not occupied. So the lodge remains spick and span, you are required to leave the lodge in a clean and tidy condition at all times. On departure you are required to clean the bunkroom you have used and contribute to cleaning of the communal living, cooking and bathroom areas. If you are the last one out then you must ensure that all fridges and freezers are emptied and cleaned, bathrooms and bedrooms are left clean. Ruapehu Lodge is situated at 1260 metres above sea level at Whakapapa Village in Tongariro National Park. It is 0.8km above the Chateau in Rehua Place. A road closure barrier and guard house are situated on the Bruce Road immediately before the road turns sharply right and up the hill. Rehua Place is immediately before the closure barrier, on the left-hand side. Two groups of lodges are situated on Rehua Place about 500m past the turnoff. Ignore the first set of lodges and continue on to the last lodge on the left, standing slightly back from the road. A Forest & Bird sign is outside. Please note: the terms and conditions of occupancy must be agreed upon or the booking request will not be accepted or processed. Member rates apply to paid-up Forest & Bird Members only. There is no key for the lodge - there is a pin code lock. The entry code will not be given until full payment is made. Please note: the entry code will be changed on a regular basis. Amendments to length of stay and number of people may be made up to 2 weeks before occupation subject to availability. No changes will be accepted in the 2 weeks before occupation. Cancellations made over a month before the first day of the booking will be eligible for a full refund of the total cost less the booking charge. Cancellations made between one month and two weeks before the first day of the booking will be eligible for a 50% refund of the total cost less the booking charge. Cancellations made less than two weeks before the first day of the booking do not qualify for a refund and will be charged the full amount of the booking. Bookings may not be transferred to other dates - the booking must be cancelled and rebooked in accordance with the cancellation terms and conditions. In the event of a cancellation a refund will only be given in accordance with the cancellation terms and conditions. No school/youth group or whole of lodge bookings during the high season. No minors are allowed to stay in the lodge unless they are accompanied by a responsible adult.